Color and Character tells the story of West Charlotte High, which opened its doors in 1938 and serves students to this day. It is no ordinary school. Jim Crow segregation, the promise and dilemmas of desegregation, the wide-reaching effects of the Civil Rights Movement and the Reagan Revolution, and the ongoing challenges of discrimination, disinvestment and gentrification. For its first three decades, West Charlotte served the African American neighborhoods on the west side of Charlotte, North Carolina, embodying community spirit, talents and ambition. In the 1970s, when the landmark Swann school desegregation case forced Charlotte schools to adopt an expansive busing plan, West Charlotte won national acclaim for the way that students, teachers, parents and community built a successfully integrated school that helped transform the city. But in recent years, ever since a new lawsuit brought busing to an end, a resegregated West Charlotte has been forced to contend with the challenges of persisting racism and with the damage done to historically black communities by urban renewal, highway construction, private disinvestment, public neglect and mass incarceration. If you want to understand the inequalities that plague prosperous Charlotte – and the U.S. as a whole – this history of a beloved school offers one place to start. Institutions such as the West Charlotte High School National Alumni Association, Queens University, Davidson College, the UNC Charlotte College of Education, the Center for the Study of the New South, the Public Library of Charlotte and Mecklenburg County, the National Black MBA Association, Parker Poe LLC, the Charlotte Hornets Foundation, the Charlotte Presbytery, Temple Beth-El, Holy Comforter Episcopal and Myers Park Methodist have used Color & Character to spark discussions about segregation, desegregation and resegregation, as well as about the ways a city’s past influences its present and the role that history can play in charting future action. 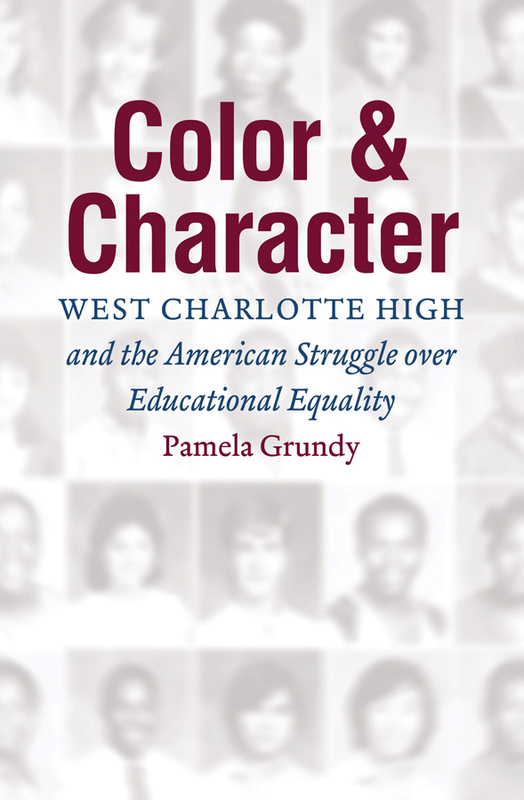 Please check the Events page for upcoming events and discussions, and the Blog page for thoughts from Color & Character author Pamela Grundy and others who care about West Charlotte, its history, and the present-day challenges it raises. Color & Character is available from Park Road Books, UNC Press and Amazon. Color and Character is a remarkable book, capturing the story of the desegregation and resegregation of one of America’s greatest high schools. It brings to life fully the success and failure, joy and pain, hope and despair at the heart of the American pursuit of racial equality. And it shows that the hopes and dreams of millions of children and their advocates depend on the ability of our schools–and our society–to work for all of us, not just the privileged few.